Corona traces back to Rock Point Misty Morning, one of our original goats. Like her great-grandmother, she is an excellent milker. Linear Appraised X. 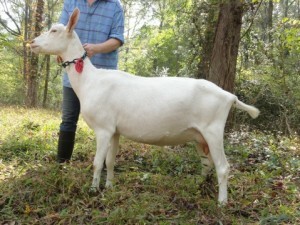 Her sire, Briarwind Imre Merlin (AS1374706) was #5 in the 2010 Saanen Elite Sire Summary. 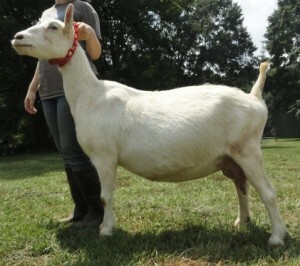 Teacup Tulip is one of our best milkers, and a lovely lady. She shares a sire with Corona, Briarwind Imre Merlin (AS1374706), who was #5 in the 2010 Saanen Elite Sire Summary. (Tulip’s picture is forthcoming). CosmicSister Superior Genetic, from a mating of one of our top milking does Colleen Rainbows (AS1209723 6*M Breed Leader 2003) to the son (Bassilgarad) of our most structurally correct doe. We have CosmicSister’s children and grandchildren for sale. I have had a great mentor and friend in Lina Pearson of Rock Point Farm. 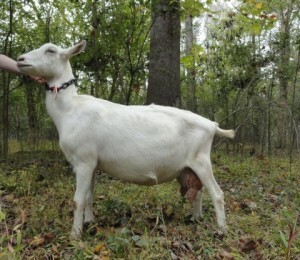 She graciously leased bucks for use in my then small herd. While a herd is not built from one sire, The Jug Tavern Not a Trace has had a significant impact recently. He gave us DP Galinda and DP Trace’s Cloud. From this line we have raised structurally correct powerful does that are excellent milkers including Gervais, Wilma, Hicicle, Sassy, Shirley, Lavern, Gizelle, and Jasper (another incredible buck). Our famous Hicicle (enunciated H optional) is the daughter of DP Trace’s Cloud, who came from DP Colleen Rainbows 4*M and The Jug Tavern Not a Trace. She has always been strong, capacious, and a good milker with a will to do it all! The ever lovely Shirley is the daughter of Trace’s Cloud and DP JS Genevive, and the grand-daughter of DP Galinda 7*M.
Claire traces back to one of our most productive milkers SG Decimal-Place Chase de Moon, her dam’s dam. 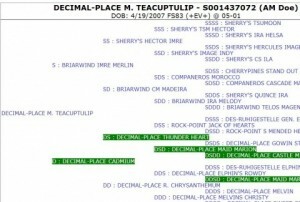 Her dam is SG Decimal Place Merlin Demelsa (AS1431152). 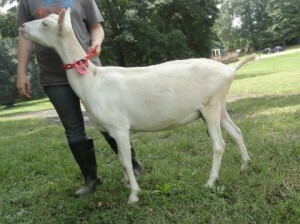 Holly is one of our beautiful Captain’s daughters, distinguished by length of bone and structural correctness. Her dam is Decimal-Place Cloud’s Hicicle (AS1519793, pictured below) is an incredible milker, and one of the most resilient goats we’ve ever met. Milicent’s dam is 6*M Merlins Corona (AS1431149, pictured below), one of our foundation does. 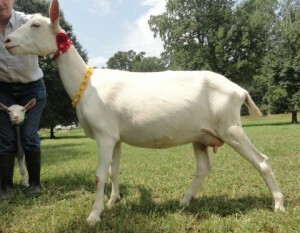 As you can see she has a beautiful body, top lines, and udder placement. Minerva is lucky to be the daughter of Araby-Farm Ccacaptain Antilles and DP Merlins Corona 6*M. She has beautiful bone structure, and excellent milk capacity. 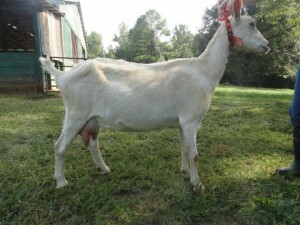 Freida is a first freshner that has done an excellent job in the herd.